Bottles dry quickly on this rack. It also looks nice on the counter. Does the job itâ€™s meant to do. Can do 8 bottles at a time which is sufficient. Looks good on countertop, modern design. 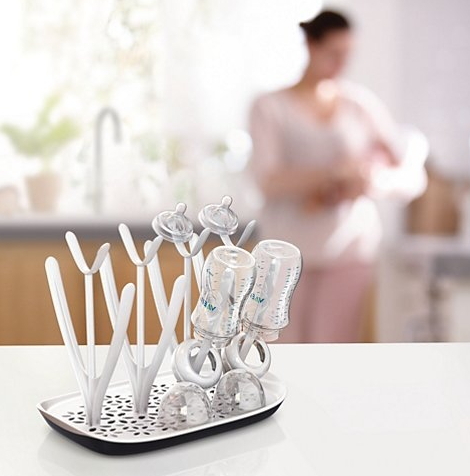 Keeps bottles and accessories tidy when drying. Great. This is a great bottle rack, i am really happy with my purchase. Definitely beats air drying your bottles on a dish cloth! Great, practical and easy to clean! 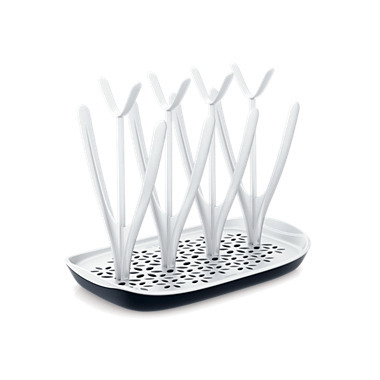 Bottles and accessories dry faster and evenly. No water drops marks or condensation and most importantly, no contamination by contact with surfaces. Bottles remain as clean as just washed. We use this product to dry our water bottles and sippy cups for the kids. Works well. Sturdy. I had a very difficult time finding a bottle rack that I liked. I did not like the boon grass as it took up too much space on my counter and I didn't like the way the bottles etc. just 'sit' on the grass - its more of a hard plastic vs a silicone which I thought it was - I also use glass bottles so I didn't like how flimsy some of the other racks 'pegs' were. So far this is strong enough for my glass bottles and still leaves enough room at the bottom for odd/ends that I can't 'hang'. However I don't bottle feed exclusively, so someone who goes through a lot of bottles in a day may not find this big enough. It makes great use of space - holds a lot without taking up too much room. Worth the money.